Naples woman Karen Federighi says she was “imprisoned” in guardianship case. “Sheer panic, like a prisoner,” she said. | F.A.C.E.U.S. NAPLES, Fla – Advocates say an increasing number of innocent Floridians are being taken advantage of by relatives or friends through the court probate system. Karen Federighi’s nightmare started with a knock on her door in January 2016. “There was a Collier County deputy who handed me a summons, and I’m looking it over in total disbelief, I’m a ward of the state, without any rights,” said Federighi, who at the time was living in East Naples. She was a registered nurse, who up until that point was working at a Southwest Florida hospital and living a normal life before she was suddenly assigned to a court appointed guardian and taken from her home. “Sheer panic, like a prisoner,” she said. The guardianship system is supposed to appoint a decision maker for a person who is too mentally or physically incapacitated to handle their own personal or financial affairs. “It relieves the pressure on families who have elderly people who need help, said Dr. Sam Sugar, founder of Americans Against Abusive Probate Guardianship. He says Federighi’s case isn’t an isolated incident. Karen inherited some money from her late father and says a jealous family member filed the guardianship claim behind her back. Even though Karen was holding down a job and supporting herself, a three person committee appointed by the court deemed her incapacitated. With the help of philanthropist who wired her some money, Karen fled Florida, eventually settling in Los Angeles. Even though she was officially freed last September. she has nothing left to her name. Dr. Sugar says there are some things you can do now to prevent or lessen the chance you may end up like Karen. He recommends hiring a power of attorney for financial and health matters, and if you’re married, have a joint bank account. “The court finds it very difficult to take away one person’s money, when it’s in a joint account with another person,” said Dr. Sugar. Karen’s nightmare isn’t completely over, she’s suing to get the money back that was taken from her during the guardianship case. 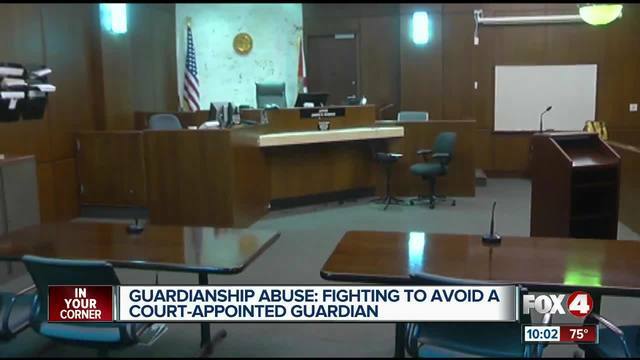 Karen, and some other victims of guardianship abuse cases filed a complaint with the FBI asking them to look into how Collier County handles these cases. 4-in-Your Corner reached out to the attorney who helped put Karen into a guardianship, but did not hear back. « North Carolinians describe guardianship as a ‘sick, twisted process and you’re just basically stripped of your civil rights.” Guardianship is a court process where anyone can claim you’re incompetent and petition to be your guardian.